What would you say if you had a chance to own a $1,021,056 million modern coastal family home (with guest pavilion!) in Pelican Waters, Caloundra, on the Sunshine Coast. The home is furnished and ready for you to move in. Offering a contemporary kitchen with hidden butler’s pantry, to comfortable lounges, relaxing bedroom suites, and on-trend homewares. All you need to do is bring your suitcase! The open plan home offers the space for morning coffee with family on the marble-topped kitchen island, and entertain guests in the evening in the spacious lounge room. In line with its location, this home matches the beautiful Queensland outdoor lifestyle. It has been designed to flow seamlessly from inside to outside, with a patio dining setting. Get ready to hold barbecues with the family! Meanwhile, the poolside lounges are just perfect for lazy days reading books in the winter sunshine. The two-storey home boasts a total living area of 235m2, including 3 bedrooms in the main part of the house and an additional guest bedroom with kitchenette and private deck. The master bedroom upstairs includes an en-suite and generous walk-in-robe. Located only 5 minutes from Golden Beach. Plus, a short drive to the surf patrolled areas of Bulcock Beach, Kings Beach and Dicky Beach. It is the perfect summer holiday home. If sunshine and sand are not your thing, the home has a rental potential of $41,600 P.A. furnished. The prize comes with $5,000 cashable gold for rates and water plus an additional $5000 cashable gold for travel. This Endeavour Foundation Prize Home draw has now closed. However, you can always enter a charity lottery draw on Oz Lotteries for your chance to win a stunning prize and help support a great cause. 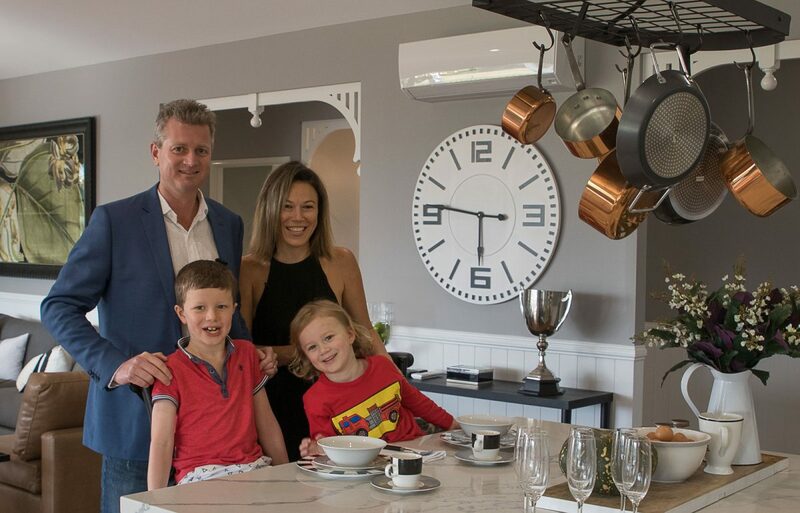 Anna & Andrew’s son persuaded them to buy extra tickets for their dream home in Maleny, hinterland Queensland. His persistence has certainly paid off, with the winning ticket being one of those extra tickets! They said the family is loving their beautiful new home. The kids enjoy running around the big backyard. If you can imagine yourself appearing in the next winner story, then grab your charity prize home ticket for your chance to win!